3/31: Clarified: set should throw an IOException if write fails to be replicated. 4/4: Clarified: setInTransaction does not acquire locks. Adding all of these replicas can increase the performance of our system when reading many large files, since each client will always have every key’s value cached. When clients read keys, they will not need to read them from the server: they can directly read them from their local cache. We will be maintaining our traditional notion of consistency: each client will always read the most recent version of each file. This means that the master will need to have some protocol to ensure that a write deemed “successful” at the server level has indeed succeeded on every active client. clear: Clear the shell screen. exit, quit: Exit the shell. help: Display help about available commands. script: Read and execute commands from a file. stacktrace: Display the full stacktrace of the last error. While we’ll still use the notion of directories, you will no longer maintain any data structure to keep track of them. Instead, to implement listDirectory and putAll, your client will simply iterate over all of the keys, and find which keys match the same prefix (so these operations will appear to behave the same). The key here is that set will now be guaranteed to touch only a single key at a time (in past HW, calling set might result in creating parent directories too). 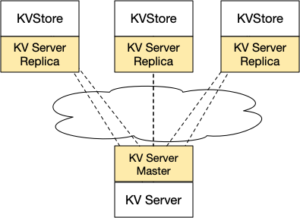 Here is a graphical summary showing how reads and writes will now work: when a client (replica) connects, the entire KVStore is copied to the client. Then, the client can read values directly (without going to the server). When a client wants to update a key, that update gets propagated to the master and to each replica. You must use exclusively reentrant locks (e.g. synchronized or ReentrantReadWriteLock), with the single exception of lockKey and unlockKey, which must use StampedLocks. Your KV Store will be compiled and tested using apache maven, which automatically downloads the various dependencies for VCFS and executes the provided JUnit tests. Please install Maven on your computer. Unfortunately, Maven is not installed on Zeus, however you can download the most recent version (e.g. apache-maven-3.5.2-bin.zip) and unzip it in your home directory. Then, to run maven, type ~/apache-maven-3.5.2/bin/mvn in the snippets below (instead of just mvn). Note that you can easily import maven projects into eclipse and IntelliJ. To compile and run your shell, run mvn package in the top level directory and then, in the server directory run java -jar target/kvstore-server-2019.3.4-SNAPSHOT.jar portnumber to start the server, and to start the client, in the client directory run java -jar target/kvstore-client-2019.3.4-SNAPSHOT.jar portnumber. Your can specify any free port number on your computer over 1024; we have hardcoded the client to assume that the client runs on the same computer as the server. You’ll notice that the text-mode interface we’ve provided for you has a handy help command. To build the jar file without running the tests, run mvn -DskipTests package. You should feel free to add whatever additional classes you wish, or any additional methods to the existing edu.gmu.cs475.KeyValueServer and edu.gmu.cs475.KeyValueClient. You must not modify the edu.gmu.cs475.IKeyValueServer interface, the edu.gmu.cs475.AbstractKeyValueClient, any of the tests, or any of the internal classes. Your code should be thread-safe: concurrent calls to any of these methods (or any other method in IKeyValueServer) should not have any races. It should now be clearer how this can occur — you will potentially have multiple clients attempting to interact with the server simultaneously. It is OK for you to use coarse-grained synchronization here, and we will not test for concurrent operations on your KVStore (unlike in HW2, where this was the primary focus). All concurrency-related grading will account for a total 0f 10% of your grade (see Part 5). We will only consider concurrency-concerns for the first 4 parts to the extent that they are preventing your assignment from passing the given tests under normal circumstances. For the very first part, you’ll configure the client and server code so that when they connect, the clients register themselves with the server, and the server provides the clients with a set of all of the keys and their values. This will form the initial cache on the client. Then, whenever the server receives a set request, it will forward that request to all registered clients, who will in turn update their caches. When a client is done, it will notify the server that it’s disconnecting, which will allow the server to stop sending updates to it. Implement your server in the server project, by implementing the empty methods in edu.gmu.cs475.KeyValueServer, and your client in the client project, by implementing the empty methods in edu.gmu.cs475.KeyValueClient. You should feel free to reuse the code you had from HW3, or write something different (you’ll notice that the API changed slightly). We’ve provided you a basic client that will automatically call the server’s registerClient method, and which will perform all read operations from its local cache. Our basic implementation of the server side registerClient will return the map to the client. For part 1, your server’s set should: (1) take out a write-lock on the file, (2) call innerWriteKey on each cache client, passing transaction ID 0, and (3) then update the file locally. There is no need to implement heartbeats like in HW3 – lock and unlock can just use straightforward StampedLocks. Similarly, lockKey and unLockKey can assume that they are only ever used for write locks. * Creates a transaction (for part 1, always uses 0 as transaction id), then locks the key, then calls innerWriteKey on each replica. * If all replicas succeed, commits the transaction and sets the key locally. Otherwise, aborts the transaction and throws an IOException. * If it is associated with a transaction, then this write must not be visible until the replicant receives a commit message for the associated transaction ID; if it is aborted, then it is discarded. Hint: To prevent replicas from joining or departing during a write (but still allowing concurrent writes to different files), consider using a ReentrantReadWriteLock to guard your list of replicas. Code that is reading the list of replicas (e.g. the set method, and in part 3, setInTransaction) would need to acquire a read lock, while code that is changing the list of replicas (e.g. when registering or departing) would require a write lock. When you are ready to check your work, you should run just the tests in the test class edu.gmu.cs475.P1Tests. To do so from maven, you should run mvn -Dtest=P1Tests test. Next, you will implement a simple two-phase-commit protocol. The motivation for this is that our implementation so far does not guarantee that each client will always see the most recent file. In particular: consider the case where clients C1, C2 and C3 are connected to the server. Client C1 updates a key Foo by telling the server. The server sends the update to C1 (OK) and C2 (OK). When it tries to update C3, it is unable to contact C3 (perhaps the network is being really slow temporarily). At this point: what should we do? If C3 is crashed, then this is probably OK: but if C3 might show up again later, then for the period of time that C3 is out of communication, it has the wrong version of file foo! To implement this portion, you’ll need to (1) update set on the server to generate a new transaction ID for each time that set is called (any number is fine as long as it doesn’t repeat) and pass that ID to each client’s innerWriteKey, (2) adapt innerWriteKey so that it stores transaction writes into a separate cache, and (3) implement commit and abort on the client to apply or abort that transaction. If every innerWriteKey successfully returns (no exception and returns true), your server should call commit on each client; if not, it should call abort on each client. * Commit a transaction, making any pending writes that are part of this transaction immediately visible. We will grade your client and server side implementation separately. We have provided a set of tests, edu.gmu.cs475.P2Tests, which automatically mock a correctly functioning server — running your client against this fake server. To run this from maven, you should run mvn -Dtest=P2Tests test. Finally, you’ll extend the notion of transactions, allowing clients to define themselves when a transaction will start. In particular, you’ll configure the client so that before a putAll starts, it creates a transaction. This way, even if writing to a single key on a single cache replica fails, the entire putAll can be aborted, and the invariant that putAll is atomic is preserved. * during a call to setInTransaction. * If all replicas succeed, returns true, otherwise returns false. * You must not allow a client to register or depart during a commit. * Sets the content for all keys that are directly contained by the given directory. * code should not deadlock while waiting to acquire locks. Again, we will grade your client and server side implementation separately. We have provided a set of tests, edu.gmu.cs475.P3Tests, which automatically mock a correctly functioning client — running your server against this fake client and simulating error conditions. To run this from maven, you should run mvn -Dtest=P3Tests test. AutoLab will automatically run RV-Predict on all of your submissions. You can run it on your own computer by downloading and installing it (it’s free for non-commercial use). When you run your tests with maven, use the command mvn -Drvpredict=/path/to/rv-predict.jar test (on Mac this would be mvn -Drvpredict=/Applications/RV-Predict/Java/lib/rv-predict.jar test). We will not give you a direct equation to correlate from # of reports from RV-Predict -&gt; a grade on this section. We will manually award up to 10 points for concurrency correctness based on no apparent races and no over-synchronization (again, one way to avoid races could be to force every operation to be serial; this would not be ideal or correct). Moreover, note that RV-Predict will find many races, but will not find all races, which we might by hand! Note also that if you make wide use of stamped locks (instead of reentrant locks or synchronized blocks), RV-Predict will report that races are possible because it can not analyze stamped locks. In accordance with the “reasonable person principle,” we reserve the right to audit your code and correct any marks that are improperly assigned, for instance, due to your code incorrectly following the specification, but passing the test. For instance: in HW1, there was a test that made sure that you allowed for very long argument lines (the requirement was that you allowed for arbitrarily long lines). The test had a very long line, of say, 9,000 characters. Hence, some students hard-coded their shells to accept input lines of 10,000 characters, which passes the test but does not meet the specification. We would encourage you to spend your time correctly implementing the assignment, and not trying to force it to pass the test. For this assignment we’ve enabled the scoreboard. It will show everyone’s scores across all of the parts of the assignment, anonymized based on either (1) the nickname that you set in AutoLab, or (2) a “random” name (drawn from the testdir random names; if your nickname was previously your name or email we changed it to a random name to make sure you understand that it will now be shown to all). Feel free to change your nickname to anything (be it your real name or a fake name), especially if it’s funny to you or others, but again, know that it will be visible to all of your classmates.